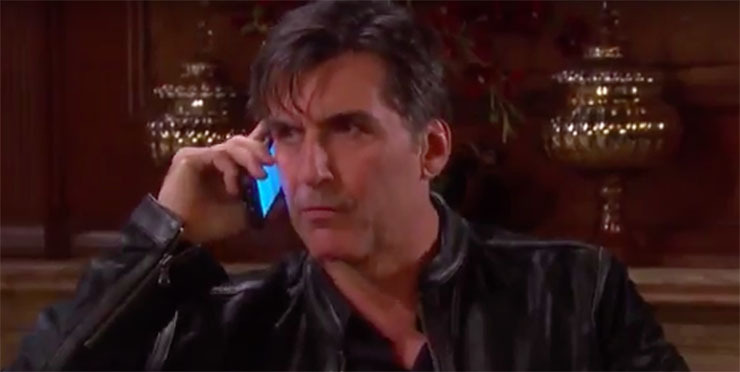 “Days of Our Lives” spoilers for Monday, January, 30th tease an hour when demands are made and secrets revealed. Nicole (Arianne Zucker) is out of jail and out of patience. She demands that Chloe (Nadia Bjorlin) give Holly up to her. Who can blame her? Holly is the biological daughter she’s wanted for so long. Chloe, meanwhile, clearly doesn’t feel the issue is so cut and dry. She is attached to baby Holly and intends to keep her. Deimos (Vincent Irizarry) is a good friend to have in your corner in a situation like the one Nicole is in. Monday he does what comes naturally to the Kiriakises: use intimidation tactics to get what he wants. And what he wants is to help his fiancee. Jennifer (Melissa Reeves) and Valerie (Vanessa Williams) get together to gab over an afternoon meal. Valerie’s been gone and while, and she hasn’t wanted to just spill her guys about everything that’s happened in her life since to just anyone. But Jennifer is easy to talk to, and Valerie admits something unexpected to her. Just when Gabi (Camila Banus) and Chad (Billy Flynn) thought they might have something together, Abby (Marci Miller) reappeared. Monday they grow further apart. Odds are, this will be easier on Billy than it is on Gabi. He has the love of his life and the mother of his child waiting at his side to pick up the pieces.